Magical Heart are a melodic hard rock band from Germany formed in 2014, releasing their debut album in 2018. Germany is a country famous for producing power metal bands, but in the shape of Magical Heart, that trend is bucked, big time! Magical Heart deliver melodic hard rock, heavily sprinkled with AOR and just a dash of soft rock. The opening salvo, 'Dream No More' hints at bands such as Aerosmith, (late eighties) Def Leppard and Journey. With an infectious groove, 'Dream No More' will have you tapping your feet and gently nodding your head. Such a catchy opening, the album gets even catchier as 'Silence And Dreams' ambles in and glides effortlessly on, keeping feet tapping and heads nodding. Add a sing a long style chorus, and you'll find yourself singing, or even humming this one, long after it's finished. One of the biggest characteristics of the AOR genre, is all the songs are memorable, catchy and unforgettable, and every song on this debut offering, is just that... 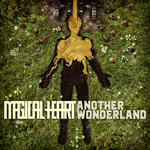 The title song 'Another Wonderland' is a little punchier than the opening songs, retaining every ounce of the albums immediate catchiness. By no means are Magical Heart a retro band, but their brand of eighties styled AOR/soft rock is as mesmeric as anything released during that era. Sing a long ability of this album is one hundred percent, so get your voices in tune and join in. 'Magic' is almost Journey like in its sound, delivering the kind of swagger that the American rock legends are famous for. Every song on the album oozes addictiveness, and I defy anyone to have not been foot tapping from the albums beginning to its very end. 'Ocean' brings a punchier, heavier hitting hard rock style to the album, the kind of punch that Mr. Big and Night Ranger brought to the rock scene. 'Ocean' remains as catchy as any other song on offer, and it appears Magical Heart have that magical touch to make everything they deliver as catchy as the activities of the early bird... 'See The Light' maintains the albums current punchier style, firmly planting both its feet in the hard rock genre. Remaining in hard rock territory, 'Shadows' is full of energy and picks up the intensity as it powers along at a mid to high tempo pace. Magical Heart are delivering a memorable album for all the right reasons, every song sing a long able and catchy. Ten songs on offer across forty five minutes, the album continues on with the power ballad 'We Are Not Lost'. Now when I say ballad, 'We Are Not Lost' is actually too heavy to raise lighters to, but is just the right vibe to sway from side to side, locking arms with a loved one as you lose yourself in the moment...this is brilliant stuff. And don't forget, this is the debut offering from a new band, a band that has set the bar very high and for their follow up album, will have to produce something bordering on the spectacular to top this one! Up tempo, hard hitting and full of energy, 'Time Will Come' is a cracking heavy rock romp. Add in one of the best screaming style guitar solos, 'Time Will Come' is a top notch melodic hard rock song. The album is brought to a close with a Southern Rock style swagger, as 'Fire On Earth' strolls boldly across the land. Standing tall and proud, 'Fire On Earth' is a corker, and a great ending to a great album. Overall, an outstanding foray of hard rock/AOR, the debut album from Magical Heart is nothing less than magical.